We specialise in creating beautiful gardens and inspiring spaces that can be enjoyed all year round. Sometimes however, clients will ask us to simply add a construction feature to their existing garden. This could be a pergola, patio, brick wall etc. These are fairly simple projects and sometimes therefore do not require a design, but just an estimate of the price. At Grassroots, we have a large portfolio of finished projects and we will be glad to share with you either by showing you our photo album, or by actually taking you to some of the sites if they are local, to help you to finalise your ideas. 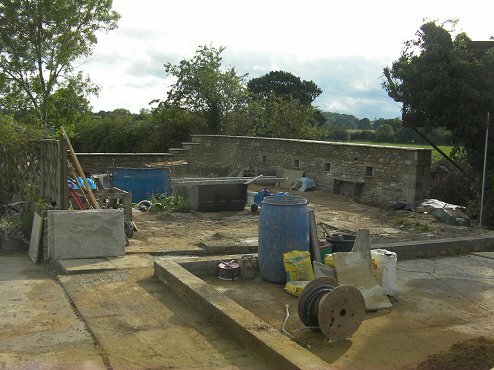 Please browse our site for full details of the services we offer and to see examples of our local work in Swindon, Wiltshire, Cirencester and the Cotswolds. This image shows the beautiful stone wall that we constructed around the site for the new swimming pool refurbishment. The old pool hadn't been in use for 20 years and the walls and base had cracked.